The 70th annual Tony Awards ceremony is almost here! We’ve pulled together some frequently asked questions about Broadway’s starriest ceremony so you can find all of the answers in one place. Happy Tonys, everybody! When are the 2016 Tony Awards? Sunday, June 12, 2016 at 8PM EST. The Beacon Theatre on New York City's Upper West Side. How can I prep for the 2016 Tony Awards? Let’s prep for the Great White Way's biggest night together! Broadway.com has joined forces with CBS to produce a pre-Tony Awards TV special. Broadway.com Presents At the Tonys, hosted by our own Senior Editor Imogen Lloyd Webber, will air on WCBS 2 in New York and across the country this weekend. Who is hosting the 2016 Tony Awards? James Corden! 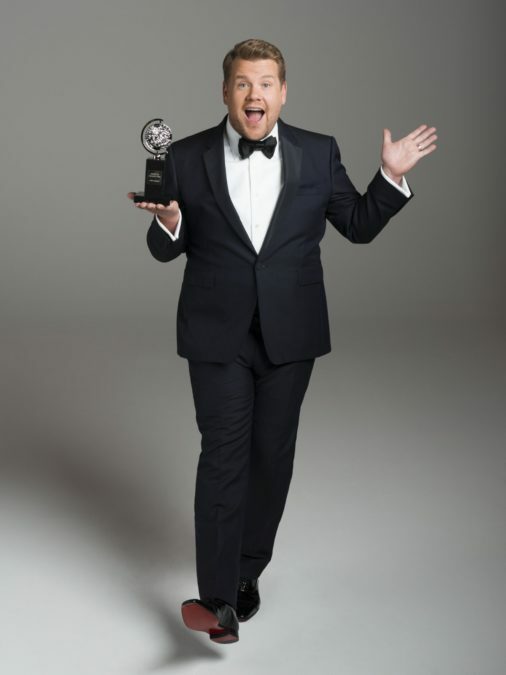 Corden, who won a 2012 Tony Award for his performance in One Man, Two Guvnors, made his Broadway debut in The History Boys. He is also the host of The Late Late Show and has moved his popular segment "Carpool Karaoke" into prominence and primetime. We can't wait to ride shotgun with him on June 12! Tune into CBS or the livestream from 8-11PM ET/delayed PT to see the presentation of the major awards and performances. Be sure to follow Broadway.com on Facebook, Twitter, Instagram, Snapchat and Tumblr for live updates and broadcasts of the red carpet, press room and more! The following international broadcasters will carry the show: Bell's CTV in Canada, PRAMER'S FILM & ARTS (AMC) in Latin, Central and South America, Sky Network Arts Channel in New Zealand, Foxtel Arena Channel in Australia, WOWOW in Japan, LeTV2, China OTT, Wasu TV, Mango TV and Beijing IQIYI in China, ABS-CBN in the Philippines and Armed Forces Network Television, which is available to the U.S. Armed Forces stationed outside of the United States. Check local listings for more info. Who are the 2016 Tony nominees? Click here for a complete list of the 2016 Tony Award nominees. Want to know the nominees’ deep dark secrets? Watch this! Want them to serenade you? No problem. Who are the presenters at the 2016 Tony Awards? A starry roster of presenters and participants will include Uzo Aduba, Cate Blanchett, Christian Borle, Common, Edie Brickell, Claire Danes, Jesse Tyler Ferguson, Josh Groban, Jake Gyllenhaal, Neil Patrick Harris, Sean Hayes, Nikki M. James, James Earl Jones, Daniel Dae Kim, Carole King, Diane Lane, Nathan Lane, Angela Lansbury, Lucy Liu, Andrew Lloyd Webber, Steve Martin, Marlee Matlin, Audra McDonald, Patina Miller, Bebe Neuwirth, Andrew Rannells, Chita Rivera, Saoirse Ronan, Keri Russell, Meg Ryan, Barbra Streisand, Aaron Tveit, Blair Underwood, Oprah Winfrey and Mary Elizabeth Winstead. The Tony Awards are always a singing-dancing event! This year, the stars of Broadway’s Shuffle Along, She Loves Me, School of Rock, Fiddler on the Roof, The Color Purple, Hamilton, Bright Star, Spring Awakening and Chicago will perform numbers. Additionally, composer and lyricist Sara Bareilles will join the cast of Waitress while Gloria Estefan will join the company of On Your Feet! for unforgettable performances. Hello! You’re already here. Check in with Broadway.com during and after the ceremony for a complete list of winners, photos, video and other highlights of Broadway’s biggest night…and don’t forget about us on Facebook, Twitter, Instagram, Snapchat and Tumblr. If you’re already following us on social media, you know we’re going to have a good time together! You can also follow members of the Broadway.com team on Twitter: Editor-in-Chief Paul Wontorek (@PaulWontorek), Managing Editor Beth Stevens (@beebea) and Senior Editor Imogen Lloyd Webber (@illoydwebber).